Here are our top picks for the best waterproof Bluetooth headphones that are entirely waterproof and deliver very good sound quality with long lasting battery life. These headphones are equipped with wireless Bluetooth streaming which allow you to stream music directly from your mobile device while doing exercises or outdoor sports. Some of these waterproof headphones are designed for underwater use and swimming, which is ideal if you need the combination of Bluetooth streaming and sound performance in a portable headphone set. They are also designed to be lightweight and fasten tightly to your ears for a secure fit. If you need headphones for water-based activities or exposure to wet outdoor elements, be sure to check out our top picks for these waterproof Bluetooth headphones below! If you are looking for swimming headphones, be sure to check out our top picks for the best waterproof headphones for swimming that are specially designed for competitive and casual swimmers. The H2O Audio is one of the best waterproof Bluetooth headphones that are completely submergible in water and ideal for swimming or sports workouts. The headphone can deliver up to 10 hours of continuous music playtime with over 8 GB memory capacity for your soundtracks (up to 2000 songs) can be stored. You can also shuffle through all your music stored inside the device. The H2O Audio features Bluetooth connectivity which allows you to stream music directly from your smartphone and also supports Spotify and Pandora. The wireless Bluetooth range is up to 30 feet although the Bluetooth does not work underwater and you will have to rely on the memory storage. The entire headphone is fully waterproof and can be submerged underwater with an IPX8 rating. It also delivers really nice sound performance with improved bass performance. The headphone also has an ergonomic design for underwater use and provides good alignment with the earbuds – it is easily attachable to your goggles or swimsuit. Overall, the H2O Audio is definitely one of the best waterproof Bluetooth headphones to check out if you are a serious swimmer looking for audio entertainment while doing laps. The sound performance of the H2O Audio headphones is pretty good, with nice treble ranges, decent midrange and a surprising amount of bass response. The way these headphones sound will depend entirely on how well the headphone earbuds fit inside your ears – so be sure to get the right fit before hitting the pool with these headphones. We liked the fact that these headphones come with many earplugs to choose from to get the optimal fit in your ears. The H2O headphones also have plenty of volume and you can crank up the volume levels without getting much distortion underwater. Music genres such as electronic dance music, rock and hip-hop sounded right off the bat very pleasant to listen to – the sound quality is decent and well balanced albeit for underwater use. The H2O headphones have a surprising amount of bass and low-end kick to the sound – the bass hits hard and make the beats of the music sound much more lifelike and enjoyable. The H2O Audio headphones have a fully waterproof design which enables it to be submerged fully underwater and is ideal for swimmers who want to listen to music while swimming. These headphones also support Bluetooth audio streaming directly from your mobile device – while the manufacturers have indicated that the Bluetooth functionality does not work underwater, we found that the Bluetooth connectivity does work normally underwater. The H2O headphones also come with all the ear pieces that you need to get the best fit inside your ears with an optimal seal – it has 8 pairs of included earplugs to choose from. The headphone also comes with a built-in clip which easily attaches to any swim goggles or swimming cap – the clip is also rotatable for flexibility. The mp3 player that comes with the headphones has 8GB of memory which is more than enough memory for your music soundtracks. The headphone has a hydrodynamic design for use underwater without hindering your movements and reduces water resistance. The Verdict? The H2O Audio are some of the best waterproof Bluetooth headphones for swimmers with a full IPX8 waterproof design and can be fully submerged underwater. It also supports wireless Bluetooth streaming directly from your smartphone device, in addition to the built-in memory storage of 8GB. The mp3 player that comes with the headphones support mp3, WMA, FLAC and APE sound formats and also allows you to shuffle through your music with built-in buttons. The Bluetooth streaming also supports Spotify and Pandora music with a range of 30 feet, although it may not work as well underwater. The headphones provide really decent sound quality with decent midranges and good bass response – they also have plenty of volume which is ideal for underwater listening. The H2O Audio headphones have a hydrodynamic design that reduces underwater resistance. It also comes with a 360 degree rotatable snap clip which attaches to your goggles and swim cap for a secure fit. Overall, the H2O Audio waterproof Bluetooth headphones deliver really good value for money and come highly recommended for swimmers and outdoor enthusiasts. The Alpatronix HX250 is one of the best waterproof Bluetooth headphones with superb sound quality and designed for underwater use. These headphones come equipped with HD Bluetooth 4.2 for fast pairing and consistent wireless music streaming. The headphones come equipped with premium audio drivers that deliver crisp highs, detailed midranges and deep lows. It comes with a built-in 8GB flash drive for music storage and supports Bluetooth streaming, although the Bluetooth streaming may be affected while swimming underwater. The headphones are fully waterproof and can be immersed into water at a depth of 1m for a period of 30 minutes; they are also ideal for intense workouts, long distance runs or for use in wet environments. The SSD memory card supports APE, WMA, MP3, FLAC and WMV music formats. The HX250 also supports intuitive playback controls which allow you to increase or decrease the volume on the go, or pause and play the music. On the whole, the Alpatronix HX250s is one of the best waterproof Bluetooth headphones we have tested and come highly recommended for its sound quality. The sound performance of the Alpatronix HX250 was much better than we expected. The earplugs that come with the HX250 headphones were able to keep water out from the ears while delivering crisp and clean sound quality. The sound performance was nice and detailed, with nice highs and timbre ranges, good midranges and decent bass performance. The level of bass response that we got from the HX250 was much better than we expected – it hits hard and makes the beat of the music come to live. Bass-heavy music genres such as electronic dance music, rock and hip-hop will sound really good through the HX250s. Vocal and instrumental performances sounded crystal clear through the HX250 headphones as any decent Bluetooth headphone would sound. The HX250s also produce a good deal of volume without any distortion at high volume levels. The acoustic driver has a frequency response between 20Hz to 20kHz and delivers pretty decent full-range sound quality. Do note that using the Bluetooth while swimming may affect the sound quality – we would recommend using the built-in memory playback while swimming. The HX250 headphones have an IPX7 waterproof rating which allows it to be submerged up to 3 feet underwater. It comes with Bluetooth 4.2 for allows for HD stereo sound performance and high quality music transmission. The headphone mp3 player comes with playback controls that allow you to play/pause, increase or decrease volume and skip between soundtracks. It even comes with a built-in microphone for you to take hands free calls with the headphone. The earplugs provide a good deal of noise isolation to block outside ambient noises and also provide a seal against water from entering. The headphones have a built-in memory of 8GB SSD that can store up to 2,000 songs. The internal battery life lasts up to 6 to 8 hours depending on the volume and charges up to 1-2 hours. The Bluetooth connectivity range is a good 33 feet and works great for workouts and gym exercises. The entire package comes with the wireless headphones, charging cable, micro USB charging cable, adjustable strap, travel pouch, user manual and 5 sets of eartips, omni-seal waterproof ear-tips and ear hooks for a secure fit. The Verdict? 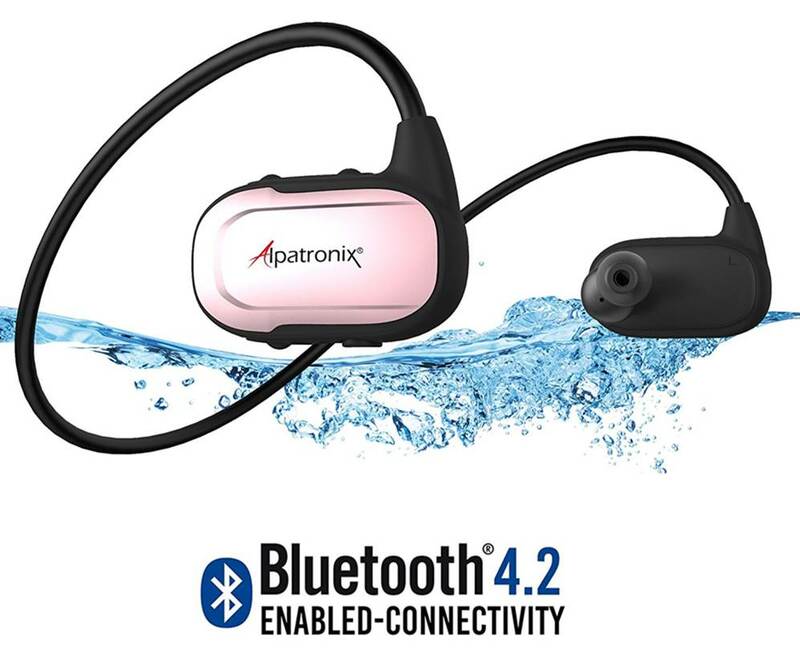 The Alpatronix HX250 is no doubt one of the best waterproof Bluetooth headphones you can get for swimming that has full waterproof resistance, Bluetooth streaming and very nice sound quality. The sound performance that we got from the HX250 far exceeded our expectations with crisp highs, detailed midranges and very good bass performance. The sound quality feels decent underwater with punchy beats that makes your swim more enjoyable. We really liked the fact that the manufacturers also provided 5 sets of ear-tips, waterproof omni-seal ear-tips and ear hooks for both underwater and outdoor sports use – this is really good to help you get the best seal over your ears and keep water out. The HX250 features Bluetooth 4.2 for high quality music streaming and also has 8GB of built-in SSD memory for you to listen to music or podcasts on the go. The headphone also has intuitive playback controls which allow you to adjust the volume on the headphone and take hands free calls with the built-in microphone. Overall, the Alpatronix HX250s are really good waterproof Bluetooth headphones for swimmers and sports fans and we highly recommend them. The Waterfi swim-kit is one of the best waterproof Bluetooth headphones designed especially for swimmers. The Waterfi headphones are completely waterproof and can be submerged underwater while swimming in the pool. The unique feature of the Waterfi headphones is that it comes with a Bluetooth antenna which can receive a signal from your smartphone up to 50 yards away for smooth wireless music streaming. You can also stream Spotify, Apple Music, podcasts and audiobooks directly from your smartphone to the Waterfi headphone while swimming. The mp3 player that comes with the headphones have intuitive controls that allow you to adjust the volume and skip soundtracks without having to reach for your mobile device. The headphone comes with the waterproof Bluetooth antenna and USB charging cable for easy charging. Overall, the Waterfi swim-kit headphones are really solid waterproof Bluetooth headphones designed for swimmers who require consistent Bluetooth connectivity and music streaming while swimming underwater. The sound performance from the Waterfi headphones was surprisingly crystal clear and detailed. The Bluetooth connection to the mobile device was stable and the wireless transmission was consistent so long as the antenna is above the water. Music performances sounded surprisingly crisp with good attention to detail. The bass performance on the Waterfi headphones is solid and tight; you really get punchy beats with the music which gets you in the mood for swimming. Audiobooks and podcasts sounded crystal clear on the Waterfi headphones without any interruptions – the earplugs do provide a good seal over the ears to prevent water from entering and muffling the sound. You can also crank up the volume on these headphones without getting much distortion close to maximum levels. The earplugs do provide good sound isolation in the pool which is ideal if you want to block out other noises in the swimming pool. Apart from the unique antenna feature, the Waterfi waterproof Bluetooth headphones sound just like any other quality Bluetooth headphones with decent quality and crystal clear sound. The Waterfi waterproof Bluetooth headphones are designed with a special antenna that sticks out of the water for consistent signal connection without any interruptions. You can simply connect your Bluetooth smartphone to these headphones and leave your phone at one end of the pool while swimming; the signal strength is good and covers up to 50 yards across. The antenna is approximately 8.5” long and provides really clear signal transmission so long as the antenna remains above the surface of the water. The battery life on the Waterfi headphones is excellent and lasts a couple of hours long on a single charge. 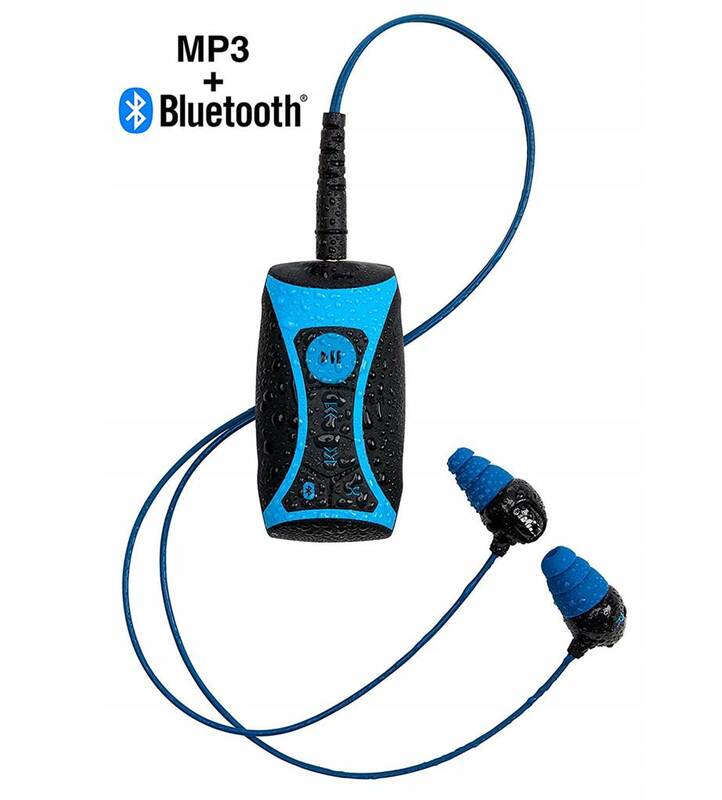 The mp3 player comes with a clip at the back which makes it easy to fasten the headphones and the mp3 player to the back of your swimming cap. It also comes with intuitive on-board controls that allow you to adjust the volume and soundtracks on the go. We liked the fact that the manufacturer also provided us with earplugs of different sizes to choose from to get the best fit in your ears for sound isolation. 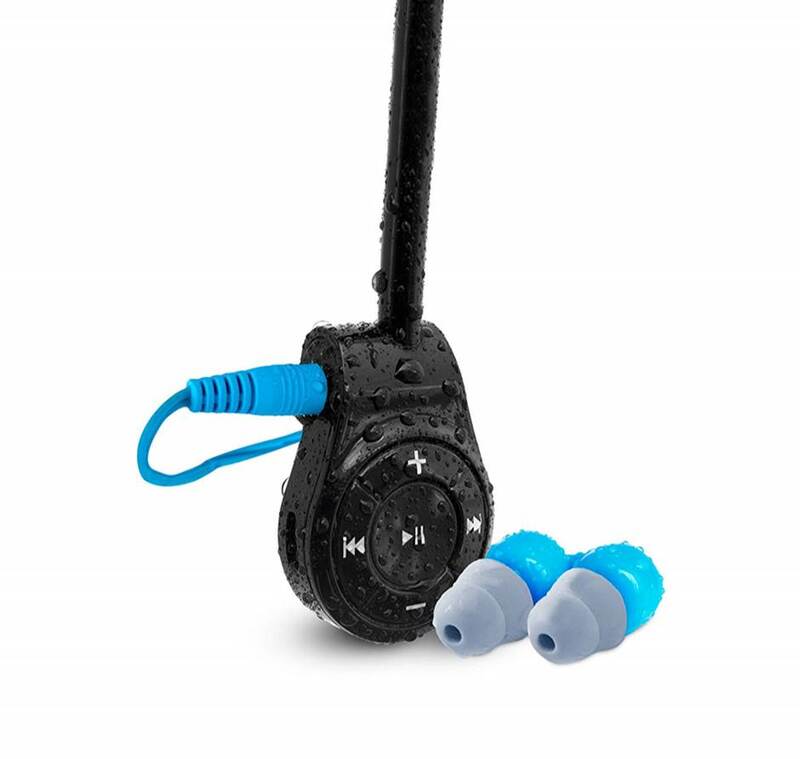 The headphones and mp3 player are also fully waterproof and submersible in water; they come in a sleek and modern durable design. The Verdict? 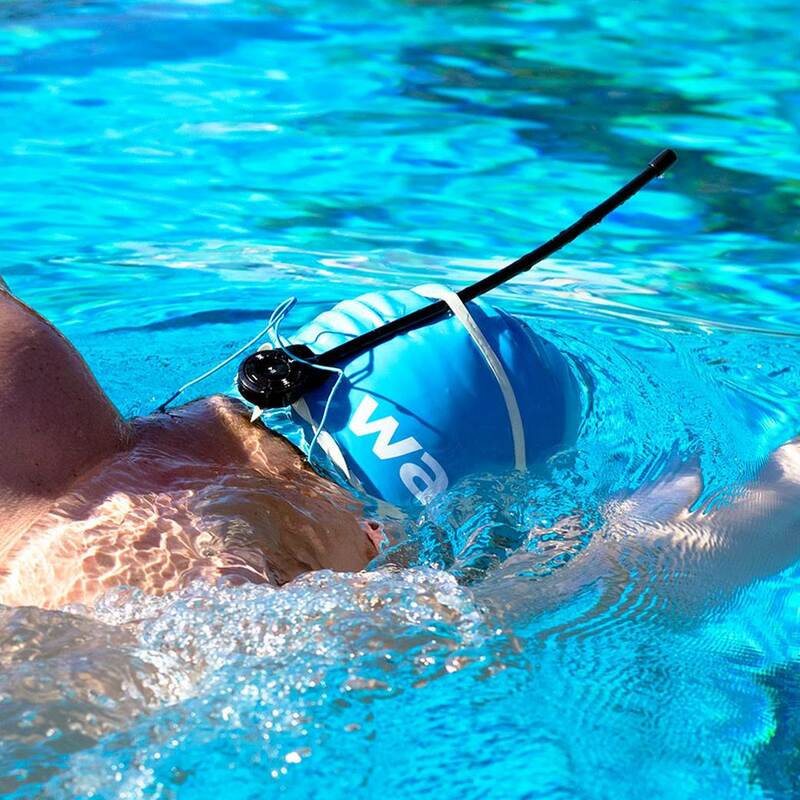 The Waterfi headphones are among the best waterproof Bluetooth headphones specially designed for competitive swimmers. The headphone comes equipped with an antenna at the top which allows you to stream music directly from your smartphone to your headphone device while swimming – the signal and transmission strength of the antenna is up to 50 yards and delivers consistent sound quality. The sound performance from the Waterfi headphones is crystal clear, with nice attention to detail and a good amount of bass for electronic dance music and rock genres. Podcasts and audiobooks also sounded really clean and crisp with the Waterfi headphones with no interruptions to the wireless streaming while swimming in the pool. Our only quibble with these headphones is that the antenna may look a little protruding on your head while swimming; that being said these headphones do have an ergonomic swim design and causes little water resistance. Overall, the Waterfi headphones are some of the best waterproof Bluetooth headphones you can find that support full Bluetooth streaming underwater and are definitely worth checking out. The Pyle Inflex are waterproof Bluetooth headphones with a really sleek design and built from marine grade waterproof materials that are capable of flexing and are adjustable during swims and workouts. It has an IPX8 waterproof rating which makes it suitable for use underwater or during high-intensity workouts. The headphone comes with built-in 8GB of memory and can store up to 2500 songs using the mp3 format. They are simple to use and operate and have a USB port for charging and music transfer. These headphones can be used to listen to music and answer phone calls. The headphone comes with wireless Bluetooth streaming functionality with a range of up to 33 feet, and also features a built-in LED indicator which shows you when the headphones are turned on. This allows you to stream music directly from your mobile device while using these headphones and they work perfectly well for swimming, running, fitness activities or exercise. Overall, the Pyle Inflex is one of the best waterproof Bluetooth headphones we have tested and are definitely worth a closer look. The sound quality from the Pyle Inflex headphones is decent and they sound just like any other quality Bluetooth headphone. The sound from these headphones is clean and crisp; vocal performances including podcasts and audiobooks sounded very nice to listen to and these headphones have plenty of volume to go around. You can really crank up the volume on these headphones without hearing any tininess or distortion which is a good thing. The audio quality is not affected while listening to these headphones underwater provided that you have the right ear plugs to provide a good seal over the ears. The bass from the Pyle Inflex headphones sounds deep with good depth, although do expect some limitations with these headphones while swimming. Apart from this, music sounded crisp and detailed with good punchy beats that really get you in the mood for exercising or swimming. The Pyle Inflex headphones definitely sound much better for gym workouts and outdoor exercises as compared to when it is fully submerged underwater. We did not experience any dips in sound quality while streaming music from our Bluetooth device. The Pyle Inflex has a really sleek and modern looking design that provides a comfortable fit. You can practically wear these headphones for a prolonged period of time without feeling any ear fatigue – it also comes with 8GB of memory and up to 13 hours of battery life. The headphone has a frequency response of 50 Hz to 15 kHz and a speaker impedance of 32 ohms. It also comes with a built-in microphone for hands free calls and a magnetic USB port for charging and data transfer. We liked the fact that the headband is bendable and adjustable which makes them really comfortable to wear – it also has an IPX8 waterproof marine grade construction. The headphone features a flexible wrap-around style which is ideal for sports activities, and also has simple touch button controls for hassle-free operation. The Pyle Inflex uses Bluetooth 4.1 for consistent high quality music streaming and has a wireless range of up to 33 feet. The entire package comes with the waterproof Bluetooth headphones, magnetic USB cable, charging earbud tips for land and water use and a travel bag for easy storage. The Verdict? The Pyle Inflex waterproof Bluetooth headphones are a really stylish and well-constructed set of headphones with a marine grade IPX8 design. They come with a large storage capacity of 8GB which allows you to store up to 2500 songs with mp3 file support. It also comes equipped with Bluetooth 4.1 for wireless music streaming and a built-in microphone for hands free calls. The Pyle Inflex headphones are made of marine grade waterproof construction and designed to be bendable and adjustable. They are relatively simple to use and feature hassle-free operation with a USB port for charging and data transfer. These headphones are really comfortable to wear and feature a wrap-around style for intense workouts and sports. The Pyle Inflex headphones are versatile for both swimming and running and deliver pretty decent sound quality – they sound just like any other quality Bluetooth headphone with clear sound and decent bass performance. Overall, the Pyle Inflex waterproof Bluetooth headphones are sleek, well-designed headphones and come highly recommended for swimmers and outdoor enthusiasts. Waterproof Rating: IPX7 Waterproof – can be exposed to direct splashes of water but is not submersible in water. Not suitable for swimming. The HBUDS H1s are waterproof Bluetooth headphones that come with virtually all the accessories and versatility that you need. The headphones are IPX7 water-resistant with nano-coating which protects the sports headphones from sweat and exposure to water – while these headphones are not meant for swimming, they work exceptionally well for intense workouts and exposure to wet environments. They are lightweight and comfortable to wear, and ideal for running, jogging and hiking or gym use. The headphones are designed to produce crisp sound with deep bass response and lower-end midrange frequencies. It also comes equipped with Bluetooth 4.1 CSR for consistent and stable wireless music streaming. The H1s are capable of delivering up to 9 hours of continuous music playtime with a standby time of 250 hours and takes up to 1.5 hours to reach a full charge. We liked the fact that the headphones come with ear hooks to keep the headphones stable on the ears; it also comes with two pairs of memory-foam ear tips and a cord clip for a secure fit. Overall, they are a really versatile and lightweight set of waterproof Bluetooth headphones and come highly recommended. The sound quality on the H1s was much better than we expected. The H1s have really nice sound quality with rich bass response and crisp highs. The treble ranges are clean and crystal clear without sounding harsh at high volume levels. The bass impact is pretty good and bass-heavy music genres such as electronic dance music and rock and hip-hop sound impactful. It really gets you into the mood for outdoor exercises and intense workouts with punchy beats. Vocal performances sounded clean and nicely defined – audiobooks and podcasts sounded really clear straight out of the box. The H1s have plenty of volume to go around and you can even crank up the volume close to maximum settings without any distortion. The headphones do provide a pretty good seal over the ears which help to keep outside noise from coming in and allows you focus on enjoying your music. While these headphones are not compatible for underwater swimming, it does provide really good IPX7 water-resistance for exposure to wet outdoor environments and can even double as showering headphones. The HBUDS H1s have a really sleek and lightweight design which makes them ideal for land-based water activities. The headphones are IPX7 waterproof which makes them suitable for exposure to water and sweat; we would however not recommend submerging these headphones underwater. It comes equipped with CVC noise cancellation technology and apt-X HD sound transmission; it supports Bluetooth 4.1 with EDR and CSR technology for consistent wireless streaming. The H1 headphones come with silicone and memory foam ear-tips with multiple sizes which is great to help you secure a perfect fit – it also securely fits into your ears with soft silicone hooks which help to secure the headphone in place. The headphone has a protective waterproof resistant shall and nano-coating shield that protects it from exposure to water and sweat. It also comes with a built-in battery capacity of 110mAh and can easily deliver up to 9 hours of continuous music playtime. The entire package comes with the H1 headphones, silicone ear-tips of multiple sizes, micro USB charging cable, user manual and a cord management clip for stability. The Verdict? 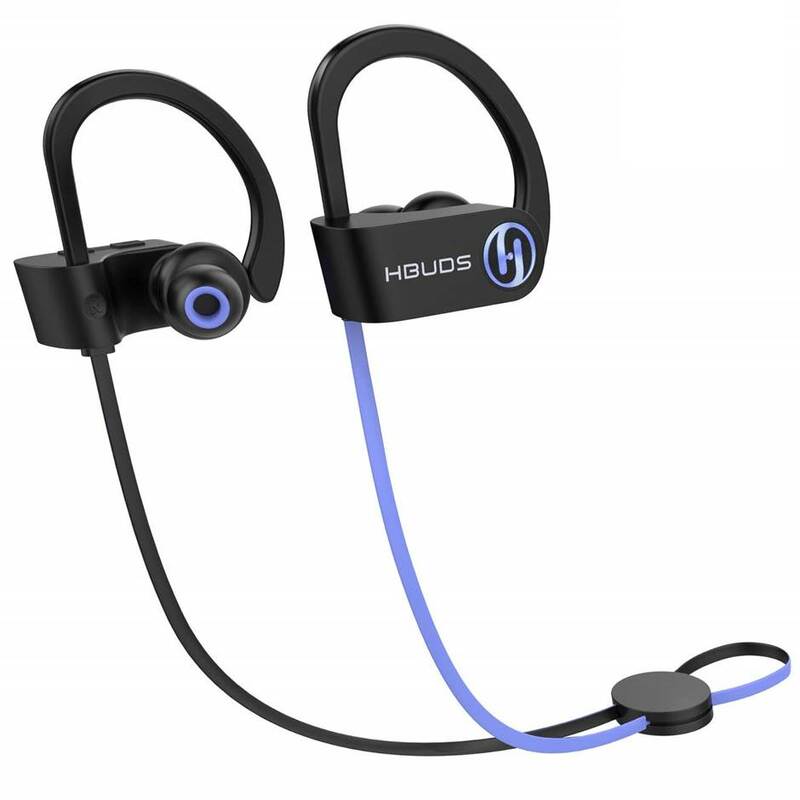 The HBUDS H1s are a really solid set of waterproof Bluetooth headphones that deliver great sound quality and a lightweight design for workouts. The highs and midranges on the headphone are replicated with distinct clarity, and the bass response and lower-end frequencies hit hard. The bass impact is present while listening to bass-heavy music genres such as electronic dance music and rock and hip-hop. The H1 headphones are IPX7 waterproof with nano-coating which effectively protects the headphones for dripping sweat and exposure to water. It also comes with Bluetooth 4.1 CSR technology for consistent and stable wireless music transmission. We liked the fact that these headphoens come with extra memory foam ear tips and 3 pairs of regular ear tips of different sizes for comfort. Overall, the H1s are lightweight, stylish, and really well-constructed waterproof Bluetooth headphones that deliver great sound quality and come highly recommended. The Senso ActivBuds are well-balanced waterproof Bluetooth headphones that deliver a good combination of sound quality, battery life and a fully IPX7 waterproof construction. The ActivBuds are capable of delivering high definition sound through its improved acoustic drivers to produce great sound quality with deeper bass and crisp highs. They are specially designed for a comfortable and secure fit with an IPX-7 waterproof rating, which means that they are perfect for use at the gym or running and will resist sweat. The ActivBuds also features an ergonomic design with flexible ear hooks with gel flex silicone earplugs to provide an extremely comfortable fit and reducing ear fatigue, while providing decent noise isolation. The battery life on the ActivBuds is a whopping 8 hours of continuous music playtime and only takes 1.5 hours to charge. It also comes with the latest Bluetooth 4.1 technology for a stable and instant wireless connection to your mobile device. Overall, the Senso ActivBuds are waterproof Bluetooth headphones that deliver a good variety of functionality packed in a small and compact device with really good sound quality. The sound performance of the Senso ActivBuds is incredible – we were pleasantly surprised at how good they sounded. The music from these headphones does not feel cheap, and sounds pretty high quality with decent highs and detailed midrange. The volume on these headphones can be driven up to near maximum volume and they will not distort a single bit. We could also hear and feel the bass response on these headphones which felt really good and punchy – these made listening to music especially enjoyable while doing workouts and you can really feel the beats in the music. We also liked the fact that the ear tips fit snugly into the ears which helps to reduce ambient background noise. This makes listening to music distraction free and you can focus on your workouts without being distracted by others. Furthermore, the Senso ActivBuds come with an integrated microphone you to take hands free calls while working out, which is definitely a nice added touch. The design of these bluetooth headphones is minimalist and comfortable. The fact that the wires go around your neck reduces any interference that may impede your movements – an issue that is usually prevalent with corded eheadphones. The comply ear tips was very comfortable to wear and stayed securely in our ears while doing workouts, and did not show any signs of falling off. The ActivBuds come with ear hooks which are made of a soft rubbery material that helps to keep the headphones in place. These Bluetooth headphones are designed to be entirely sweat-proof which makes them perfect for outdoor runs or rigorous gym use. The manufacturers also provided two extra sets of ear tips of varying sizes for you to try them on to get the best fit for your ears. Do note that while these headphones are IPX7 waterproof, they are not meant for swimming or for prolonged immersion underwater. The Senso ActivBuds come equipped with Bluetooth 4.1 technology with noise suppression technology which helps to block out ambient noise from calls or while listening to music. The Bluetooth range on these waterproof Bluetooth headphones is around 30 feet and the connection feels stable and consistent – we did not experience any sudden drops in sound quality while taking calls or listening to music on your mobile device. The battery life lasts a whopping 8 hours on a single charge with 240 hours of standby time. The entire package comes with a hard carry case, a short and long charging cable for you to easily charge the ActivBuds. The charge time is approximately 1.5 hours which is pretty quick. 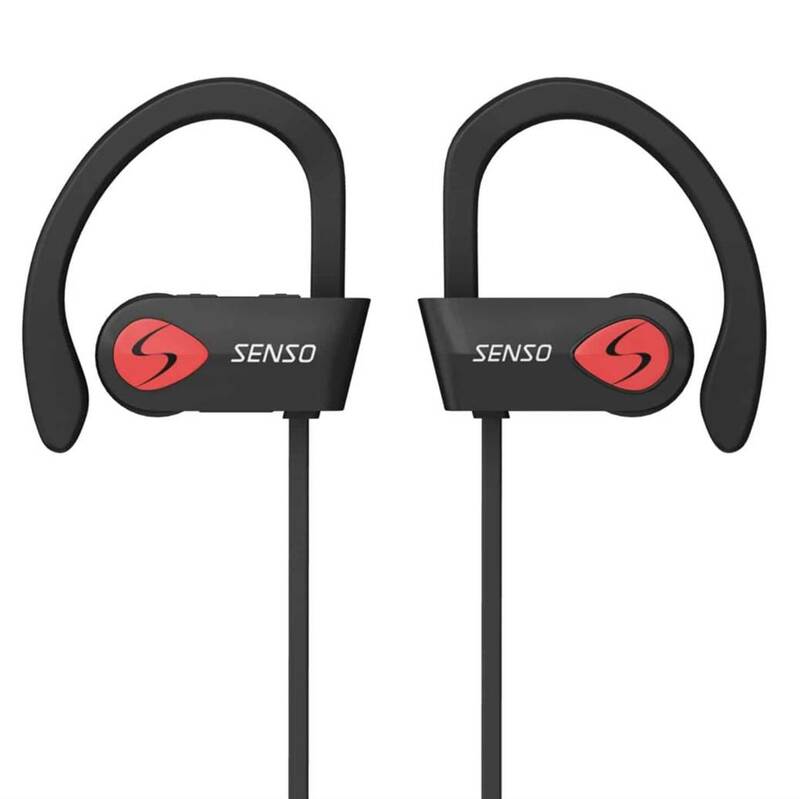 The Senso ActivBuds are really goof waterproof Bluetooth headphones especially if you need a set of headphones for intense workouts under wet or humid conditions. The headphones come with an IPX7 waterproof nano coating for protection against sweat and water and are specially designed to securely fit over your ears comfortable and snugly. It also comes with noise suppression technology to reduce ambient background noise while working out or taking calls. The sound quality on these headphones is full-range and does not feel tinny – the sound signature is on the slightly bass-heavy side, which enhances the beats in the music. This makes listening to music on the ActivBuds particularly enjoyable and fun for exercises. Furthermore, the battery life on the ActivBuds lasts an incredible 8 hours of continuous playtime on a single charge, making them one of the few waterproof Bluetooth headphones that deliver really solid sound quality with good battery playtime. The WEIZ waterproof Bluetooth headphones are some of the most durable headphones designed with a fully IPX7 structural waterproof construction – this means that you can use these headphones for water-based activities including swimming, snorkelling, parasailing or even showering. It comes high quality acoustic drivers that deliver crystal clear sound performance with decent bass impact, and also features in-line omnidirectional microphone for you to make hands free calls. The headphone also works with smart assistants including Siri. The WEIZ headphones come with earplugs in different shapes and sizes – it has an ergonomically adjustable ear hook that conforms nicely to your ear size for a comfortable fit. The headphone earbuds are designed to line up with the ear canal structure and fit comfortable inside the ear canal and provide good sound isolation. Furthermore, these headphones come with advanced CVC 6.0 noise cancellation technology which blocks out ambient background noises for you to enjoy your music even in noisy environments. Overall, the WEIZ headphones are some of the most durable waterproof Bluetooth headphones we have tested and deliver really good sound quality and performance. We were quite surprised at how good the sound quality from the WEIZ headphones was. Vocal performances sounded right off the bat crisp and well-defined with nice timbre ranges. The highs sound present without being too harsh, while the midranges sounded really good and detailed. The bass hits hard with plenty of impact and really adds a nice flavour to the lower-end frequency ranges and the beats. The bass does not sound overwhelming or bloated at all. The headphones also have plenty of volume and you can practically crank up the volume on these headphones without hearing little to any distortion. Instrumental music sounded clear with a good degree of sparkle with very clear details. We definitely loved how country folk and electronic jazz music genres performed on the WEIZ headphones. While these headphones are not audiophile quality, they really do produce very good quality sound and sound much better than what you would expect from Bluetooth headphones of this size. Our only quibble with the WEIZ headphones is the slight hissing sound that comes from the earplugs while taking hands free calls. Apart from this, it’s really hard to go wrong with the sound quality on the WEIZ headphones. The WEIZ headphones are some of the most durable headphones we have tested and come with a full IPX structural waterproof design. This means that you would be able to bring these headphones for virtually any water-based activity including swimming, surfing or even as showering headphones – do note that these headphones can withstand full immersion in water although the Bluetooth connectivity may be affected underwater. The WEIZ headphones use Bluetooth 4.1 with EDR compatibility for high quality music streaming – it is compatible with virtually all Bluetooth enabled devices running iOS, Android or Windows platforms. It has a Bluetooth range of up to 33 feet and a built-in battery that delivers up to 8 hours of continuous music playtime on a single charge. It also comes with a micro USB charging cable of about 2 feet long. The CVC 6.0 noise cancellation technology works pretty well to provide a quiet listening experience, although do expect some noise to go through particularly high-pitched noises. The entire package comes with the WIEZ headphones, USB charging cable, user manual, carrying case, wire clamp for stability and 6 ear plugs to choose from. This provides you with the added option of choosing the right ear plugs to fit your ears. The Verdict? The WEIZ headphones are really solid waterproof Bluetooth headphones with an extremely durable design and full IPX7 structural waterproof construction. This means that the entire headphone is not just coated with IPX7 waterproof material, but is designed to survive immersion underwater for swimming or showering. The sound quality that we got from the WEIZ headphones was much better than we expected, delivering rich highs, detailed midranges and really solid bass that makes the beats in the music sound impactful and enjoyable. The headphone also comes with an in-line microphone for hands-free calls and works with Siri. The headphone itself is very comfortable to wear and comes with adjustable ear hooks for a stable and firm fit over the ears. We also liked the fact that the manufacturers provided 6 ear plugs of different sizes to choose from for a comfortable fit. The headphones also feature CVC 6.0 noise cancellation which helps to block out ambient background noises for quiet listening. Overall, the WEIZ headphones are some of the best waterproof Bluetooth headphones we have tested with a full IPX7 structural waterproof design. 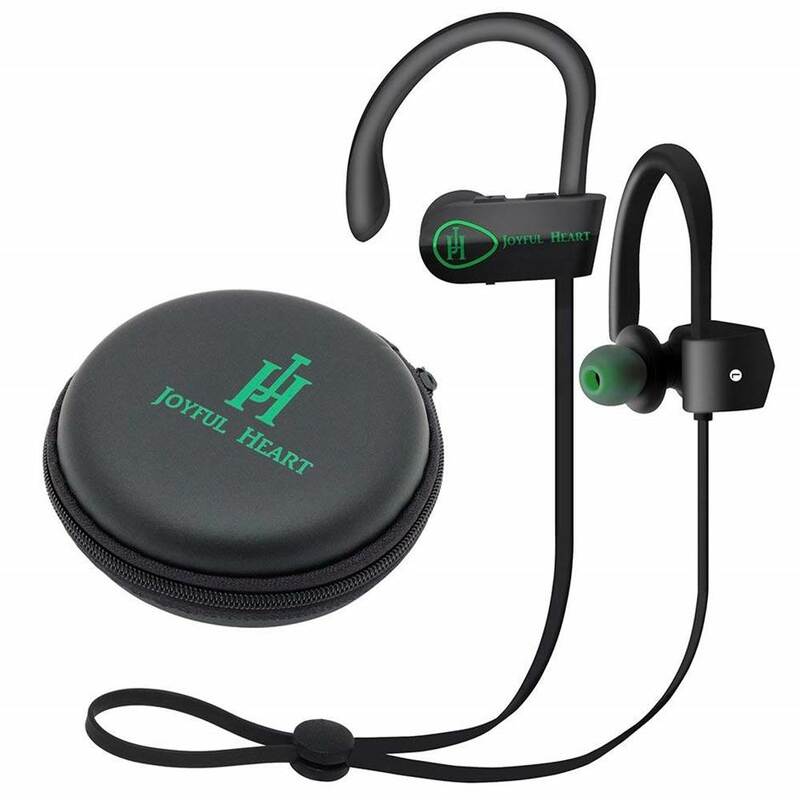 The Joyful Heart JH-800 is a really versatile set of waterproof Bluetooth headphones that delivers great value for money. It comes with a really well-balanced acoustic driver that delivers crystal clear sound performance and distortion-free sound quality. These waterproof headphones are come with a built-in microphone and works well with iPhone, Apple Watch devices and any android smartphone. 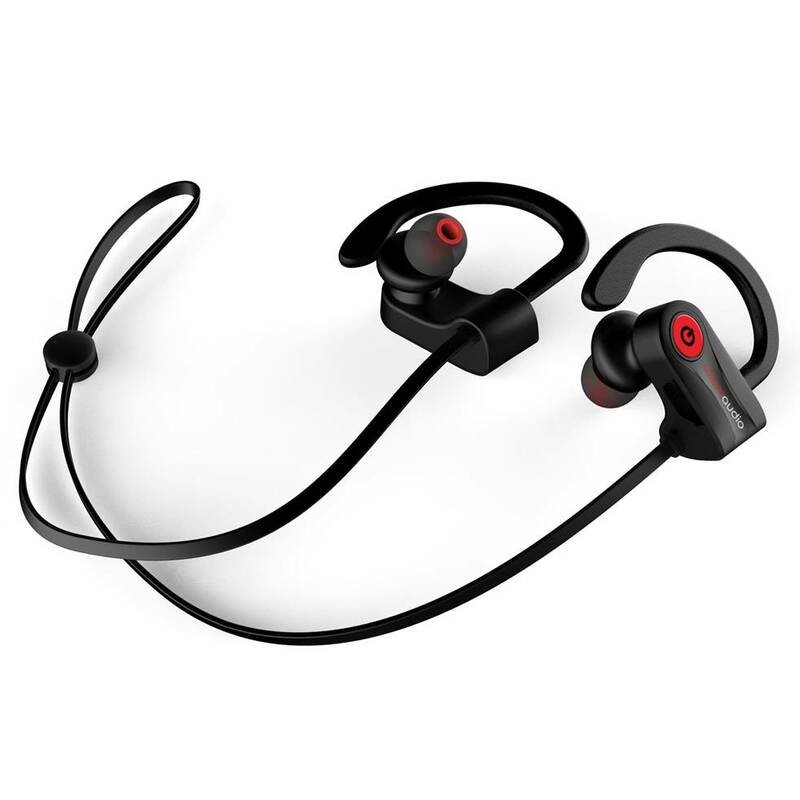 They come with a full IPX7 waterproof rating which makes these headphones resistant to water and sweat, and come with a secure fit with ear hooks for running and intense workouts. The JH-800 also comes with advanced aptX wireless Bluetooth streaming and CVC 6.0 noise cancellation technology for a quieter listening experience. The headphone uses Bluetooth 4.1 for quality wireless music streaming and can pair with up to 2 devices simultaneously. The headphones also come with a built-in battery that can deliver up to 8 hours of continuous music playtime on a single charge. Overall, the Joyful Heart JH-800 is one of the best waterproof Bluetooth headphones we have tested and is definitely worth a closer look. The sound quality from the JH-800 headphones is very impressive and much better than we expected. Music performances on the JH-800 sounded crystal clear with detailed sound quality – you really get full-range sound with these headphones and it does not sound tinny or harsh at higher volume levels. The frequency response on the JH-800 headphones is excellent and covers the highs and midranges really well. The highs sound crisp and clear, with nice timbre ranges and vocals. The midrange to lower-midrange frequencies are well articulated and sound surprisingly full with decent audio clarity. The bass on the JH-800 headphones hits hard and feels tight and punchy – bass-heavy music genres will definitely benefit from this low-end sound reproduction from these headphones. Electronic dance music as well as rock and hip-hop sounded very fun and enjoyable to listen to, and the beats really get you in the mood for working out. While these headphones are not designed for underwater use or swimming, they have a full IPX7 waterproof rating and can be used in wet outdoor environments or for intense workouts with their sweat resistance. The JH-800 waterproof headphones have a really sleek and modern looking design .It comes with nice ear hooks which help to secure a firm fit over the ears during workouts to prevent it from falling off. The ear hooks are also soft and comfortable to wear over the ears. The headphone earbuds fit in nicely into your ears and provide a good seal which helps to isolate sound and improve the bass impact. The headphones feature a miniature neckband design that goes around your neck which reduces dangling wiring. These headphones also feature Bluetooth 4.1 with an EDR chip for high quality music streaming – they have a signal range of up to 30 feet in open spaces or 10 feet in enclosed areas with obstacles. We found that the Bluetooth connectivity was really smooth and the sound quality was consistent even while streaming from our mobile device. The battery life on the JH-800 is a good 8 hours of continuous music playtime and takes less than 2 hours to reach a full charge. It also comes with a built-in microphone for hands free calls and you can also connect up to two Bluetooth devices simultaneously with these headphones. The Verdict? The JH-800 are some of the best waterproof Bluetooth headphones that deliver really good value and overall sound performance. The sound quality that we got from the JH-800 headphones is surprisingly crisp, detailed and clear with good attention to detail. The upper-midrange frequencies are well-defined with nice timbre ranges and vocal performances sounded clean and spacious. The sound frequency ranges in the bass and lower-midrange regions were also well-articulated with good attention to detail – bass heavy music genres will definitely shine with the JH-800s and the punchy beats really got us in the mood for exercises and workouts. The JH-800 headphones use Bluetooth 4.1 with EDR chip for high quality music streaming and are compatible with iPhone, Apple Watch, and android smartphones. It also comes with a built-in battery that delivers up to 8 hours of continuous music playtime on a single charge. The headphones have a full IPX7 waterproof rating which makes them impervious to sweat and water, although they should not be fully submerged into water. Overall, the JH-800s are a really solid set of waterproof Bluetooth headphones and come highly recommended. Waterproof Rating: IPX6 Waterproof – can be exposed to direct splashes of water but is not submersible in water. Not suitable for swimming. The TaoTronics TT-BH07s are some of the best waterproof Bluetooth headphones you can find on a budget that delivers really good sound quality and a IPX6 waterproof design. These headphones are perfect for intense workouts, sports and outdoor exercises. The BH07s deliver really crisp sound performance with plenty of volume with its acoustic drivers; it also features Bluetooth 4.2 which provides consistent quality wireless music streaming directly from your mobile device. The headphone comes with built-in magnets that enable you to attach the two headphones together while not in use – it also has an over-the-neck design which provides a tangle-free experience while working out. It also comes equipped with a CVC 6.0 noise cancelling microphone which reduces outside noises and allows you to take hands free calls on the go. The TT-BH07 headphones are really versatile and work nicely with all smartphone, tablets and Bluetooth enabled devices. It also has apt-X codec for high quality music streaming with compatible devices. Overall, the TT-BH07s are really solid waterproof Bluetooth headphones you can get on a budget and we highly recommend them. The sound quality of the TaoTronics TT-BH07 headphones is crisp, clear and very well-balanced. It even comes with a noise cancelling feature which helps to block out ambient background noises for a comfortable listening experience – this is ideal if you want to focus on the music during workouts in a gym or in open spaces. Music performances sounded crisp and well-defined with nice highs, midranges and a good amount of bass response. Vocal performances sounded crisp and lifelike with nice timbre ranges – the sound quality does not feel harsh or tinny at all. We liked the fact that you could really crank up the volume on the TT-BH07s without hearing any or very little distortion at maximum volumes. The bass on the TT-BH07s hits hard with nice impact – you can literally feel the beats in the music and it really gets you in the mood for intense workouts. The bass response on the TT-BH07s is solid and punchy although you will need to get the right earbud sizes to secure a nice seal over your ears to prevent any bass leakage. The sound quality of the TT-BH07s, while not the best that we have heard, is really good for a set of headphones on a budget. 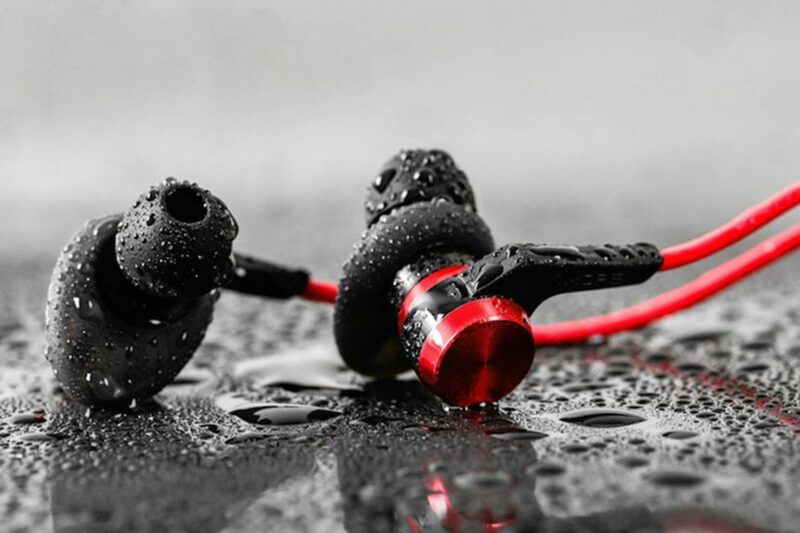 The TaoTronics TT-BH07s have an IPX6 waterproof rating which means that it can survive direct splashes of water and sweat, although it cannot be submerged underwater. These headphones are not suitable for swimming although they work perfectly well for sports and gym use. The TT-BH07 headphones are surprisingly comfortable to wear and provide a snug fit into the ears – it also has built-in magnets which allow the headphones to attach to each other for easy storage. The headphone features the latest Bluetooth 4.2 technology for high quality music streaming and apt-X functionality – this allows you to stream HD sound quality from compatible apt-X devices. The built-in battery provides a solid 6 hours of continuous music playtime on a single charge and it takes roughly 1 hour to charge up. It also comes with a built-in microphone for easy hands-free calls and noise isolation technology to keep out ambient background noises. The entire package comes with the TaoTronics TT-BH07 headphones, 3 sets of ear tips, 3 ear hooks, charging cable and user manual for easy reference. The Verdict? The TaoTronics TT-BH07s a really good set of waterproof Bluetooth headphones you can find on a budget that delivers really good value. The headphones deliver really crisp and detailed sound quality with nice highs, good midranges and deep bass response. The bass response on these headphones hits hard with plenty of depth and does not muddy into the midrange frequencies – this allows you to enjoy the beats in the music while working out. The TT-BH07 headphones have an IPX6 waterproof design which makes it suitable to resist splashes of water and sweat, although these headphones should not be submerged into water or used for swimming. It comes with a built-in battery that delivers 6 hours of battery life and 175 hours of standby time. The CVC 6.0 noise cancelling microphone does provide some degree of sound cancellation for focused listening. We liked the fact that these headphones support Bluetooth 4.2 with aptX streaming for high quality music transmission. 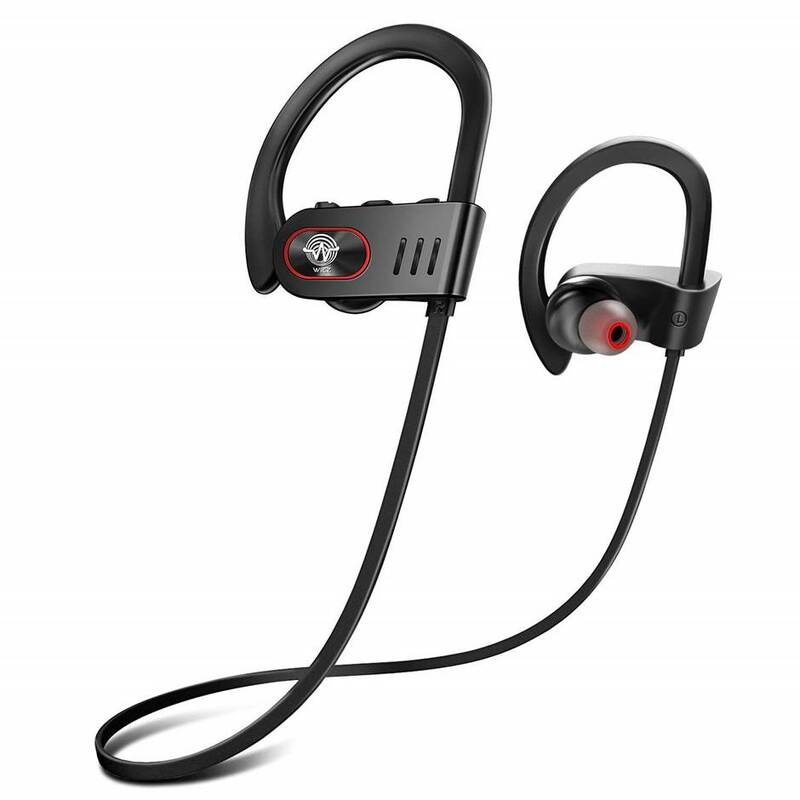 Overall, the TaoTroncis TT-BH07s deliver really good value for money and are waterproof Bluetooth headphones that are worth considering if you need a set of headphones on a budget. The Hussar Magicbuds waterproof Bluetooth headphones deliver a stunning battery life of 9 hours of continuous music playtime on a single charge. The entire headphone is IPX7 waterproof and comes with a really durable construction for intense workouts and exposure to water. It has an optimized circuit design to ensure high performance and improved reliability, and provide a secure fit behind your ears and rests comfortably in your ear canal. The headphone provides really crisp sound quality with advanced apt-X wireless Bluetooth streaming, and provides great sound quality with deep bass response and clear treble ranges. The heaphone also comes with noise reduction CVC 6.0 technology which helps to reduce background noises while taking hands free calls. It comes with Bluetooth 4.1 connectivity for fast and consistent wireless music streaming, and syncs with virtually all Bluetooth enabled devices including iPhone, iPad, Android and other mobile devices with a range of up to 33 feet. Overall, the Magicbuds are sleek, comfortable and well-designed waterproof Bluetooth headphones that definitely deserve a closer look. The sound performance of the Hussar Magicbuds surpassed our expectations. It has a wide frequency range between 20 to 22 kHz which is really good, and delivers crisp highs, detailed midranges and good bass response. The sound quality of the Magicbuds is crystal clear with a heavy emphasis on the lower-end bass response. This means that bass-heavy music genres such as electronic dance music, rock and hip-hop will sound particularly good on the Hussar headphones. You can literally feel the beats as you exercise in the gym or workout through the day. The volume on these headphones gets pretty loud although it may start to distort and sound muffled at close to maximum volumes. The wireless Bluetooth streaming on this headphone is consistent and clear and we did not experience any lags or dips in sound quality while watching movies on the mobile device or streaming music. The headphones also provide a relatively good seal over your ears which keep outside background noises from entering and allow you to focus and enjoy the music. The overall sound quality of the Hussar Magicbuds is very good and crisp. The Hussar Magicbuds come with a great variety of features that make it really worthwhile to have. It has a solid battery life of 9 hours of continuous music playtime which is great. It features an IPX7 waterproof nano coating which makes the headphones sweatproof and suitable for outdoor use without any issues. That being said, do note that these headphones are not suitable for submersion underwater or for swimming – they are great for land based activities in wet environments and are sweat resistant. We liked the fact that the manufacturers also provide premium memory foam ear tips to choose from for extra comfort. The headphones feature Bluetooth 4.1 and EDR technology that provides quality consistent wireless music streaming; the CVC 6.0 noise cancellation improves call quality and blocks outside noises from entering while using the headphones. It also supports Bluetooth HFP, HSP, AVRCP and A2DP wireless pairing for versatility. In terms of design, these headphones are sleek, modern and lightweight – they feel really comfortable on the ears and do not easily come off loose. The headphone comes with an extra set of ear tips, micro USB charging cable, carrying case, cord management clip, memory foam tips, aluminium climbing hook and a user manual for easy reference. The Verdict? 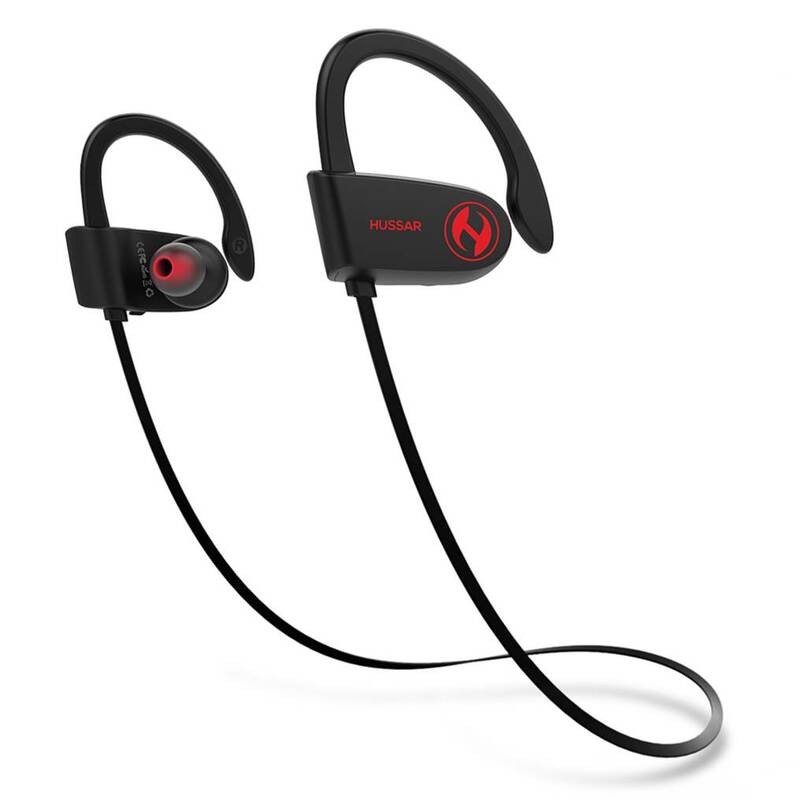 The Hussar Magicbuds are some of the best waterproof Bluetooth headphones you can find that deliver really crisp sound performance with long lasting battery life. It is fully IPX7 water-resistant and sweatproof, which means that they are suitable for outdoor usage without any issues, although they should not be submerged underwater. It also comes with a separate set of headphone earbuds of different sizes to choose from and memory foam ear tips for added comfort. The headphone itself is very comfortable to wear and stays securely fastened on the ears – it also has an optimized circuit design which improves performance and reliability. The headphones deliver really nice sound performance with very deep bass response – the bass hits hard, although it may start to sound muddy at higher volume levels. That being said, they are really fun and enjoyable to listen to especially for electronic dance music genres. The headphones uses Bluetooth 4.1 and EDR technology for wireless music streaming, and come with CVC 6.0 noise reduction for hands free calls. Overall, it’s one of the best waterproof Bluetooth headphones with a sleek and modern design and comes highly recommended. 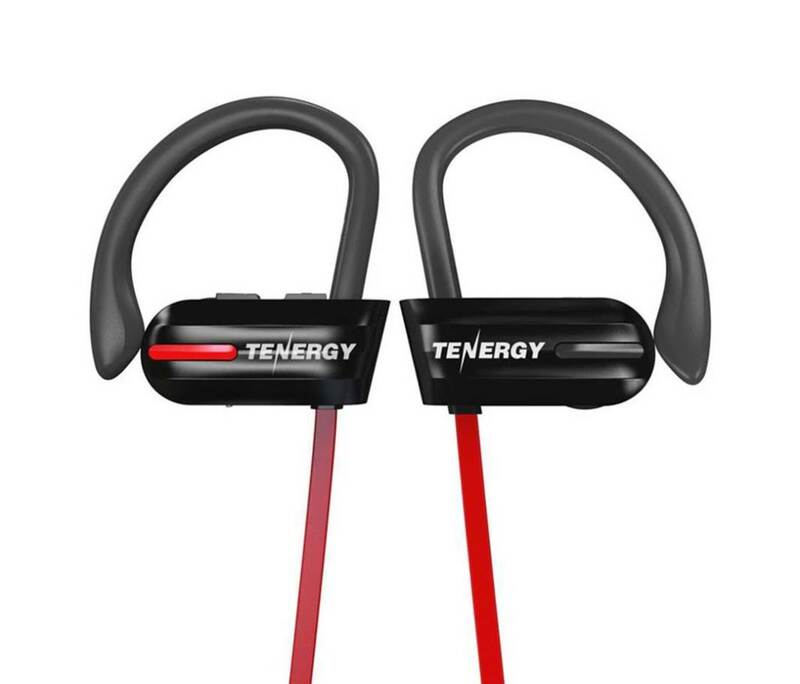 The Tenergy T20 waterproof Bluetooth headphones are built specifically for sports and outdoor use. The headphone features a full IPX7 waterproof design which protects against exposure to water and sweat, although they should not be immersed underwater. These headphones come equipped with Bluetooth 4.1 CSR technology for consistent high quality audio streaming, together with CVC 6.0 noise isolation that reduces surrounding background noises for a comfortable listening experience. The acoustic drivers on these headphones produce very crisp and natural stereo sound with good detailed separation; the bass response is strong and punchy which enables you to keep on going during gym exercises. The T20s come with an adjustable sports armband which allows you to carry your smartphone wherever you go. They are the ideal headphones for jogging, hiking and outdoor activities and can be used under heavy rain. It also comes with a 100mAh lithium-ion battery that provides up to 8 hours of continuous music playtime and 1-2 hours of charging time. Overall, the Tenergy T20s are some of the best waterproof Bluetooth headphones that deserve a closer look. The sound performance of the Tenergy T20s clearly surpassed our expectations. The audio clarity on the T20s is very clear even while connected to mobile Bluetooth devices during intense workouts with no audible lags or static interference. The frequency range on the T20 is pretty wide, with crisp highs, nice midranges and deep bass performance. The bass on the Tenergy T20s really stands out and hits hard – bass-heavy music genres sound particularly delightful on the T20s. Vocal performances were clean and well-defined, which makes listening to audio books and podcasts a very smooth experience with the T20s. These headphones also have plenty of volume and you can practically increase the volume settings close to maximum without hearing much distortion. The in-line microphone that comes with the T20s works well during hands free calls and we were able to communicate with the person at the other end of the line clearly without any issues. While the sound quality on the T20s is not the best that we have heard, it surpassed our expectations for a set of headphones in this category and delivers great value for money. The T20s have a pretty sleek and unique design with a red wiring cord that looks very clean and is tangle-free. The cable length is approximately 21 inches long and goes around the neck easily. We particularly liked the fact that the T20s come with 3 sets of ear tips to choose from for optimal fit, and also comes with a memory foam ear-tips set for a comfortable listening experience. The ear hooks on the T20s go over the ears without any issues and feel soft and lightweight. The headphones use Bluetooth CSR 4.1 technology for wireless music streaming and has a transmission range of up to 30 feet. The T20s are IPX7 waterproof and come with CVC 6.0 noise cancelling technology which helps to keep out ambient background noises. It charges via the included micro-USB cable and takes 1-2 hours to reach a full charge with a battery life of up to 8 hours. We also liked the fact that the T20s come with a armband which you can use during workouts to store your smartphones. The entire package comes with the T20 headphones, a carrying case, USB charging cable, 3 ear tip sets, one memory foam ear tip set, one mini wire tie and a user manual for easy reference. The Verdict? The Tenergy T20s are some of the best waterproof Bluetooth headphones that are designed for hard-core sports use. The entire headphone is designed with IPX7 waterproof resistance and is suitable for exposure to wet environments and dripping sweat without any issues. They come with multiple sizes of ear tips and ear hooks which provide a secure and comfortable listening experience. The T20s feature Bluetooth 4.1 technology with an ergonomic design that conforms naturally to your ear size – the silicone earbuds rests comfortably on the ears which help to prevent ear fatigue after prolonged use. The T20s uses Bluetooth 4.1 CSR technology for a consistent and high quality music performance, together with CVC 6.0 noise isolation to keep out background noises. It also comes with a 100mAh battery life that provides up to 8 hours of playtime and takes 1-2 hours to reach a full charge. The sound performance on the T20s is crisp and clean, with a good degree of bass response. Overall, the T20s are a really solid pair of waterproof Bluetooth headphones that are great for outdoor enthusiasts and come highly recommended. The Otium IPX7 headphones are really good waterproof Bluetooth headphones that deliver crisp sound performance and IPX7 sweatproof resistance with a lightweight frame construction. These Bluetooth headphones are designed for wireless music streaming with high-definition stereo sound performance. It has a built in battery capacity of up to 8 hours of continuous music playtime which is great, and features Bluetooth 4.1 for high quality music streaming. The headphones are also capable of producing crisp highs, detailed midrange and deep bass response at any volume level; it also comes with a built-in microphone with voice notification for incoming calls. The Otium headphones are specifically designed for sports, gym, and outdoor use and comes with comfortable ear hooks to securely fasten to your ears. 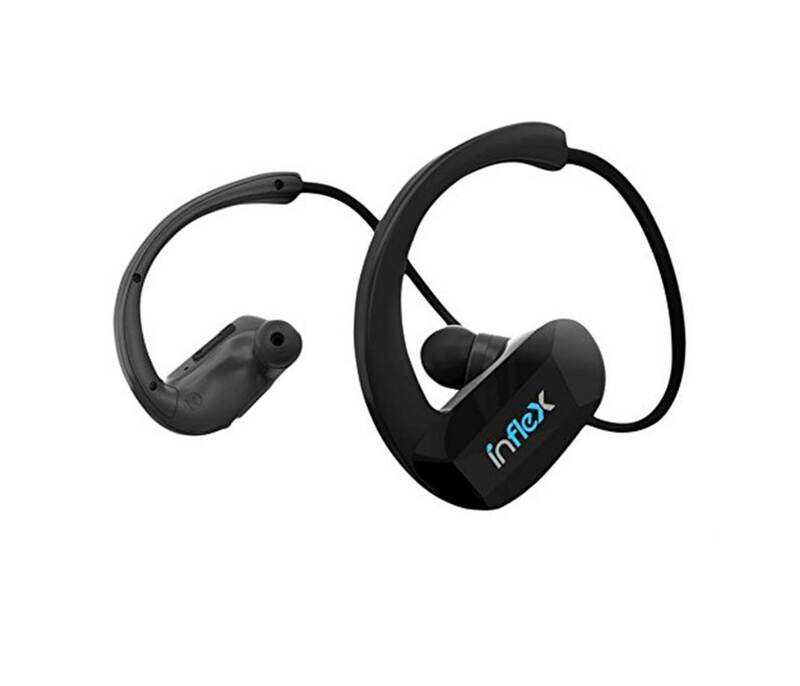 They are rated IPX7 sweatproof which means that you can use these headphones for rigorous sports activities under wet and humid conditions without any issues, although they should not be fully submerged underwater. The Otium headphones have a Bluetooth range of up to 30 feet and can also connect to two mobile devices simultaneously – it is compatible with both iOS, android and other Bluetooth devices. Overall, the Otiums are waterproof Bluetooth headphones that excel in delivering really nice sound quality with a lightweight and compact design. The sound performance of the Otium waterproof headphones far exceeded our expectations. They have rich clear sound performance with deep bass that hits hard and does not muddy into the midrange frequencies. The sound quality is sharp and well-defined even with the EQ settings turned off. Vocal performances sounded really clean and well defined; the sound feels natural without any artificial enhancements. Subtle instrumental notes can be reproduced by these headphones with decent clarity and a good degree of stereo separation. Electronic dance music and rock and pop music sounded surprisingly good to listen to with deep punchy beats – you can also crank up the volume on these headphones with very little distortion. The treble and midranges sound nicely balanced and also have pretty decent soundstage and imaging, making them really enjoyable for watching movies or videos. The Bluetooth connection is table and does not cut off or produce any hissing noise while streaming music. In terms of sound performance, the Otium Bluetooth headphones deliver above expectations. The Otium waterproof Bluetooth headphones have a pretty sleek and modern design that feels comfortable when worn around the neck. 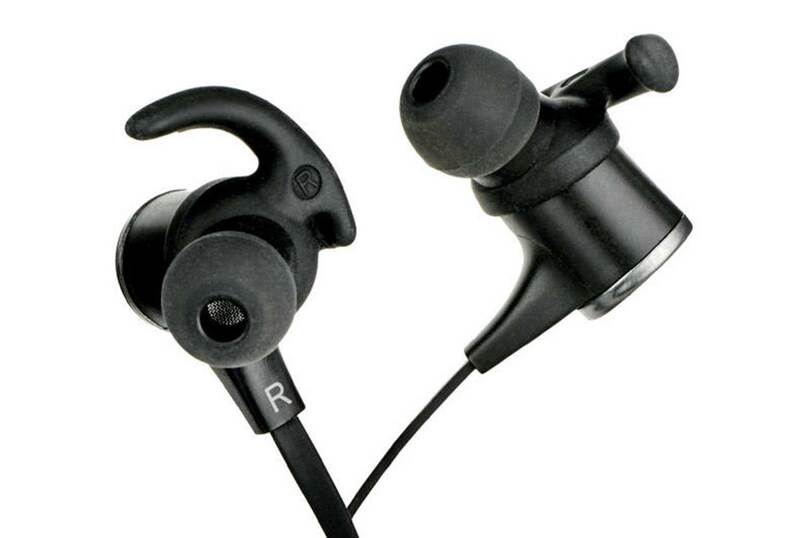 It comes with ear hooks which fasten the headphones firmly to the ears without them coming off easily. While these headphones are not noise cancelling, the earplugs do block out a lot of ambient background noises which may distract from your listening experience. The Otium headphone comes with built in battery life of 8 hours of continuous music playtime which is much better than average. It also features easy to use buttons including pause, play and skip controls for you to cycle through your soundtracks while doing workouts without having to adjust it directly from your phone. The headphones are equipped with Bluetooth 4.1 for high quality music streaming and has a good range of up to 30 feet, or 10 feet in obstructed areas. They also pair very quickly with most iOS and android devices, and also come with a built-in microphone with voice notification for incoming calls. They are very lightweight and comfortable headphones to wear – you can practically wear these for hours on end without feeling fatigued. On the whole, the Otium headphones are ideal for sports and physical activities such as running, jogging, biking and for gym use under wet or humid conditions with a full IPX7 waterproof rating, although they should not be submerged underwater. The Verdict? The Otium Sports headphones are waterproof Bluetooth headphones you can find that deliver really crisp sound performance, quality lightweight design and long lasting battery life. The sound quality that you get with these Bluetooth headphones far exceeded our expectations, with crisp highs, detailed midranges and very nice bass response. Music genres such as electronic dance music and rock and pop sounded very enjoyable to listen to, while vocal performances were reproduced with great attention to detail. We particularly liked how loud these headphones can go with very little distortion even at maximum volumes. The headphones come with ear hooks which help to stabilize them while worn on the ears; they are also lightweight and comfortable to wear for prolonged periods of time. It also comes with ear plugs which provide a good seal over the ears for sound isolation and keep out unwanted background noises for an enjoyable listening experience. The Otium headphone supports Bluetooth 4.1 wireless streaming and comes with a built-in microphone to take hands free calls on the go. The on-board controls are definitely an added plus for you to adjust your soundtracks without having to do so from your mobile device. Overall, it’s one of the best waterproof Bluetooth headphones that deserve a special mention on this list and comes highly recommended.